(dedication). The book is a picture book featuring young Ethiopian children ages one to twelve. The book begins with a foreword from children’s book author Jane Kurtz and a dedication from Ethiopia Reads. 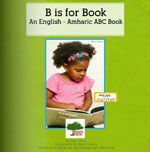 Each page introduces an English alphabet and an object beginning with that letter along with the Amharic word for the object written both in Amharic script and phonetically using Latin alphabet. The centerpiece of each page is a picture of smiling young child/children, with their name and age, with the relevant object. The last two pages of the book feature pictures from Ethiopia Reads projects and a facts and information on the organizations activities. The last page is a picture of the Ethiopian alphabet. B is for Book is an engaging book for the youngest readers with its colorful pictures and smiling young faces. The graphics and color add to the cheerful style and feel of the book. As indicated in the dedication, the book would be of special interest to parents with Ethiopian children who are interested in introducing them to Ethiopian culture and alphabet. Young Ethiopian readers will be able to see and identify with the children pictured in the book and with help begin to recognize the Ethiopian alphabet. It’s also a great tool for helping young children learn Amharic words and begin their study of this Ethiopian language. The wider audience for the book could also include new learners, young and old, of Amharic.